June 12, 2014, 6:32 p.m.
Last weekend the Texas Republican Party adopted their platform for the 2014 elections. 7,000 delegates assembled and, among other things, decided to endorse &apos;reparative therapy&apos;, often known as gay conversion therapy, which aims to provide &apos;treatment&apos; to homosexuals so that they can become heterosexual. Despite the decision to endorse this highly controversial and widely discredited practice, the Texas Republican Party did also do away with language that said "homosexuality tears at the fabric of society". 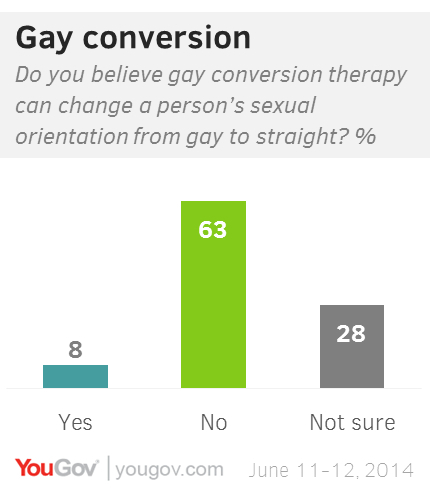 For the majority (63%) of Americans, gay conversion therapy is unable to change a person&apos;s sexual orientation from gay to straight, with only 8% saying that therapy can do that. 28% of the public say that they aren&apos;t sure either way. Despite this belief that gay therapy cannot change someone&apos;s sexual orientation, 37% of Americans do think that being gay or lesbian is &apos;just the way some people choose to live&apos;. 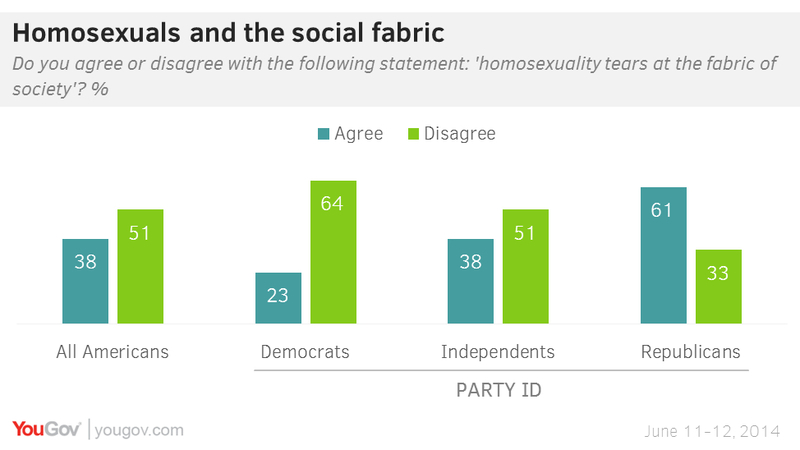 Asked whether homosexuality tears at the fabric of society, however, nearly two-fifths of the country (38%) say that it does, while 51% say that it doesn&apos;t. Attitudes among Republicans and Democrats are almost the exact opposite, with 64% of Democrats saying that it does not tear at the social fabric compared to 61% of Republicans who say that it does. The Republican Governor of Texas, Rick Perry, courted further controversy on the issue a few days ago when he compared homosexuality to alcoholism. At a speech in San Francisco he said "I may have the genetic coding that I’m inclined to be an alcoholic, but I have the desire not to do that - and I look at the homosexual issue the same way."